I swear, these meatballs are revolutionary. If you have never been a fan of meatballs – these meatballs will change your perception of them and your whole world. You will fall head over heels in love with these juicy, herby and tasty little things. Purely because there’s a surprise in these meatballs! Just imagine – juicy and flavourful meatballs with a mashed potato and carrot filling inside – yummy, huh? And the genius who inspired me is Bobbi from Bam’s Kitchen. Please head over her kitchen if you have not done so. Her kitchen’s full of delicious and international cuisine that made me salivate all over the keyboard whenever I read them, and I’m sure you’ll be like me after you’ve read through all her delicious and mouth-watering recipes! 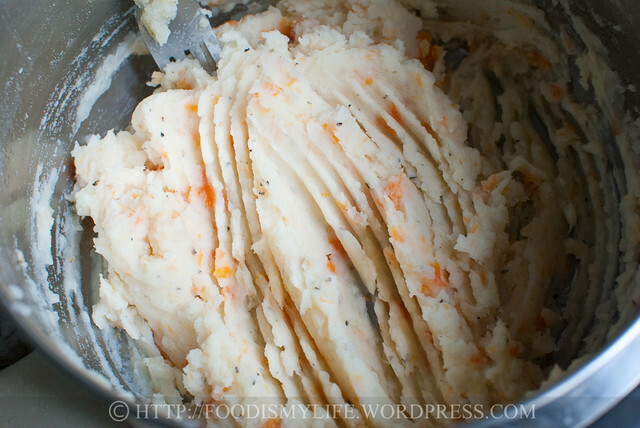 Bobbi used whole baby potatoes when she made this but I didn’t want the meatballs to be so big, so I decided to go for a mash route – using my mashed potato and carrot recipe, I modified it slightly by omitting the cream. 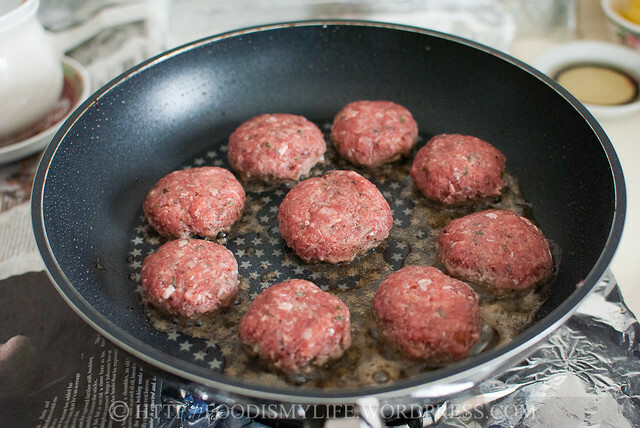 Then I shaped them into rounds and wrap the meat filling over them before pan-frying them. Even when the potato filling ooze out, they will turn into a crispy crust as you pan-fry them – so I really think it’s a win-win situation! And oh my, oh dear, oh god – they were soooo incredibly addictive! They make perfect appetizers, snacks, picnic food and lunch / dinner (toss with some pasta sauce!) – I think they go perfectly well with almost anything! One Lovely Blog from Cait at 366 Photographs and Villy at For the Love of Feeding and Chi Khong from Chi Khong Photography. I stumbled onto Cait’s blog while browsing for photography blogs on WordPress and boy, I was immediately hooked! She owns a photography blog featuring stunning and beautiful foods of food, sunsets, landscapes, nature, cityscapes and people. A photo speaks a thousand words, so do head over there and see what her photos “say”! Thank you Cait! Chi Khong‘s also owned a photography blog and I was mesmerized immediately the moment I found his blog. He mentioned on his blog that he only picked up photography at the start of the year – I find it hard to believe it… because all the photos are so beautiful and amazing! I’m really loving this, this, this and this. I really got to buck up my photography skills… 😉 Thanks Chi Khong for the nomination! Click “more” to continue with the step-by-step photos! First cut up some potatoes and carrot (do cut the carrot into smaller pieces than potatoes – I found out that they take a slightly longer time to cook than potatoes). Grab two garlic cloves (unpeeled) as well. Take a photo of them – Happy Family! 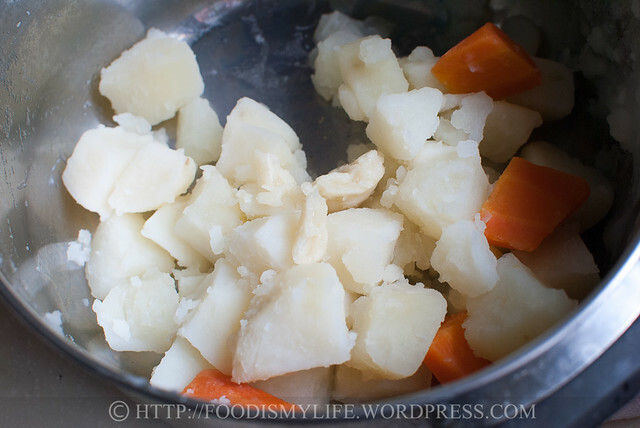 Add the potatoes, carrot and garlic cloves into a pot of boiled and salted water and boil till tender soft. Drain and set aside to let the excess moisture evaporate. While it’s still hot, mash the potatoes, carrot and 1 garlic clove together (the other clove goes into the meatball mixture). Season with salt and black pepper. And also add in some butter – it can never go wrong with butter! And some Parmesan cheese, purely optional! Mix them all up together and try not to eat it by the spoonful – it’s that good! Scoop about a teaspoon of the mashed potato mix and roll it into small balls – dab your hands with a little water so that the potato won’t stick. 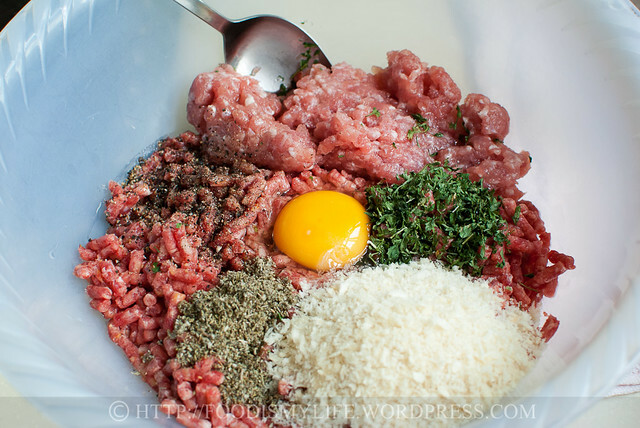 Next, combine the meatballs ingredients – ground beef, ground pork, breadcrumbs, dried parsley, dried sage, egg, salt and black pepper. Mix together and add in 1 clove of the softened garlic (without the skin) – then mix altogether again. 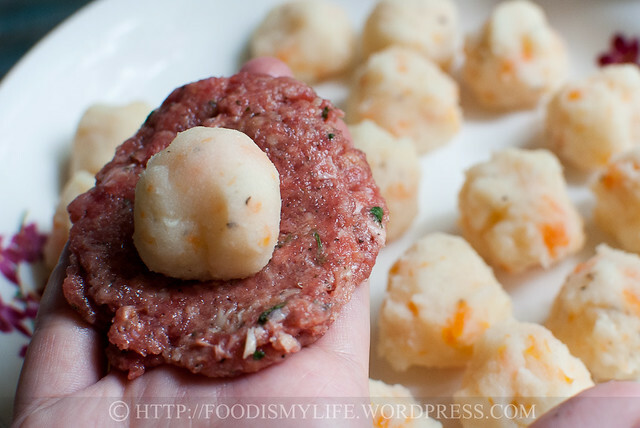 Grab some meatball mix, flatten it into a round and place one potato ball in the middle. Wrap it up into a large meatball! I ended up with about 25 meatballs. Pan-fry them in a little oil until browned all over – the potato’s already cooked, so just have to ensure the meat is cooked! Flip it over and fry the other side! Some potato may ooze out but that’s okay, life’s not always perfect anyway! 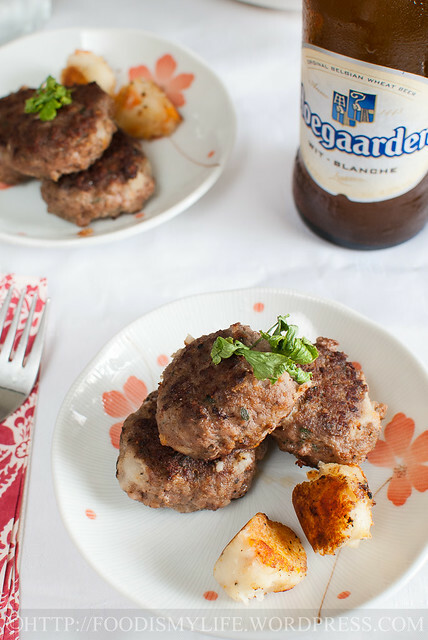 Strongly recommended to serve it with a bottle of icy cold beer! Boil a large pot of water and add in the potatoes, carrot and garlic cloves. 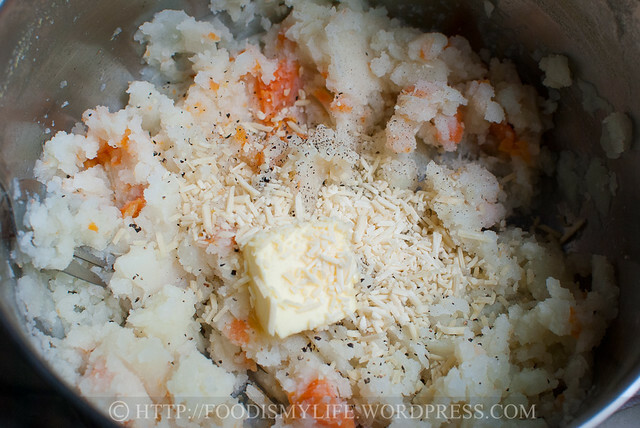 Simmer until both potatoes and carrot are tender. 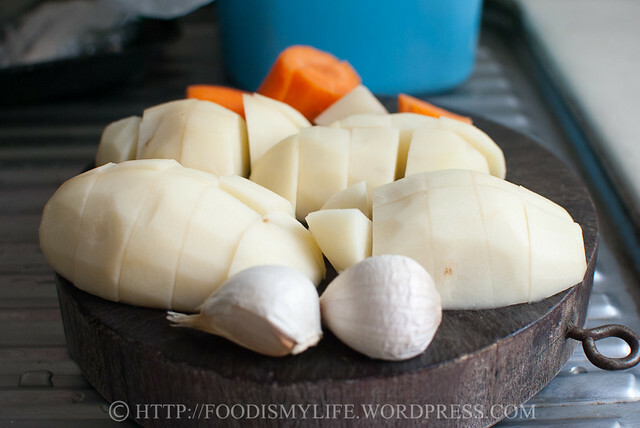 Drain and return the potatoes and carrot into the pot (place the garlic cloves on a chopping board). 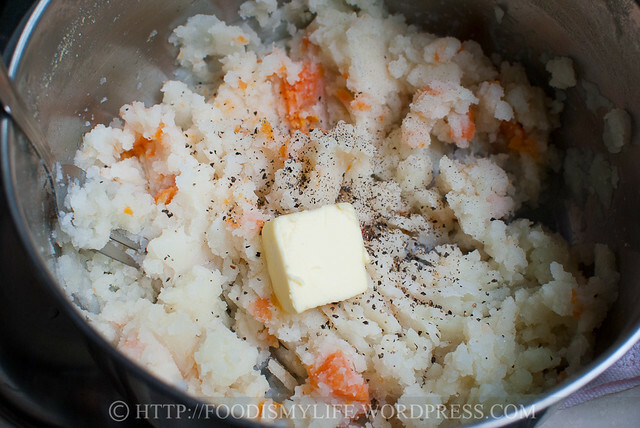 Cook the potatoes and carrot over very low heat until all the water has evaporated. Remove from heat and set aside. Using a spoon / fork, gently apply pressure onto the garlic cloves, the garlic should smoosh out easily. Discard the skin. Add one garlic clove to the potato-carrot and the other to a mixing bowl for the meatballs. 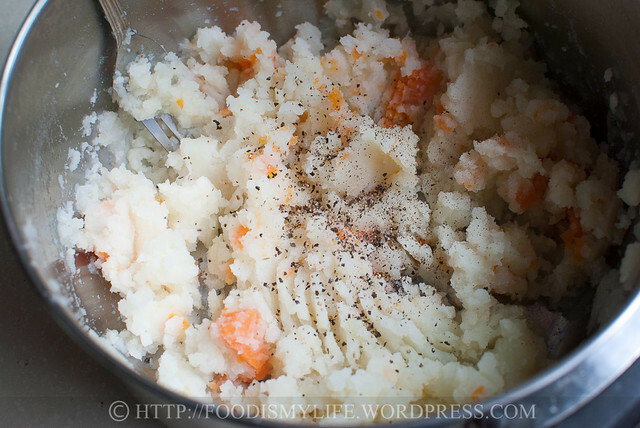 Mash the potatoes, carrot and garlic (while they are still hot). Add in butter, Parmesan cheese and season to taste with salt and black pepper. 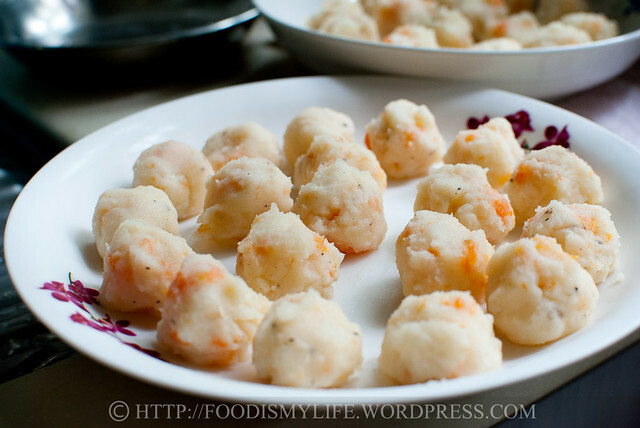 Scoop small teaspoons of potato-carrot mix and roll them into small balls. Dab your hands with a little water to prevent the mix from sticking. Set aside. In the mixing bowl with the other clove of garlic, add in both types of ground meat, parsley, herbs-of-your-choice, bread crumbs, egg and salt and black pepper. Mix well. Heat a large non-stick frying pan over medium heat. 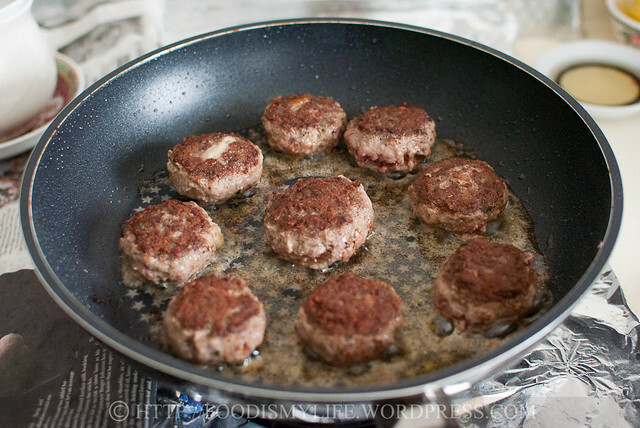 Add in some oil and fry the meatballs in batches till thoroughly cooked through. 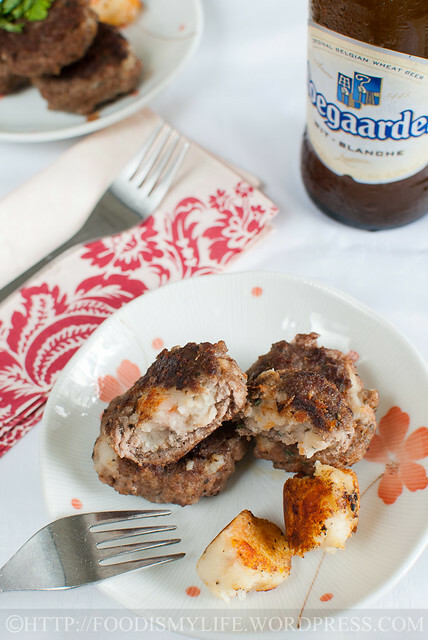 Serve warm with a bottle of icy cold beer! Also perfect with some salad greens and pasta! 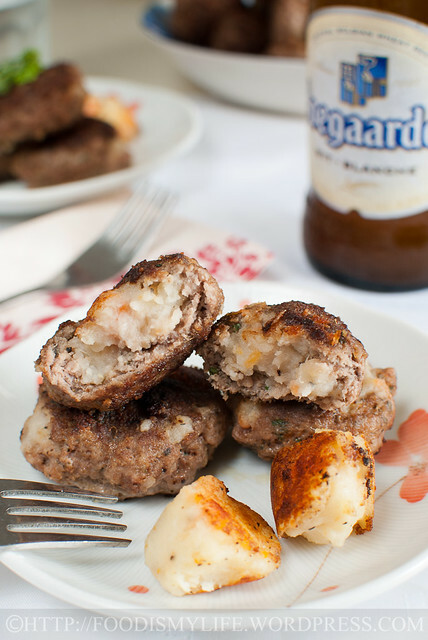 To take this dish one step further (and many steps more sinful), dip the rolled meatballs (with the potato-carrot inside) in flour, then beaten egg and then Panko. Deep-fry them and you’ll get a delicious Surprise Meatball Croquette! If you’re lazy to make the potato-carrot mix, use mini baby potatoes. Prick with a fork all over and boil them in salted water until tender. Drain, let cool and proceed with the wrapping. You’ll most likely end up with extra meatballs or potato-carrot balls. 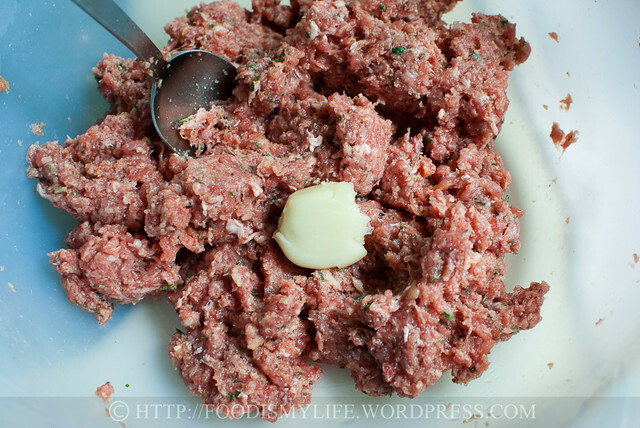 Just pan-fry them together with the other meatballs – still very tasty! These meatballs look amazing! I love the idea of filling a meatball with vegetables. this is inspiring, never thought of putting some potatoes in it. i also like that you mentioned it goes crispy when you pan fry them again.yum! Congratulations on your award. I hope you are having a lovely holiday. I saw the recipe at Bam’s and like the idea of using mashed potatoes. 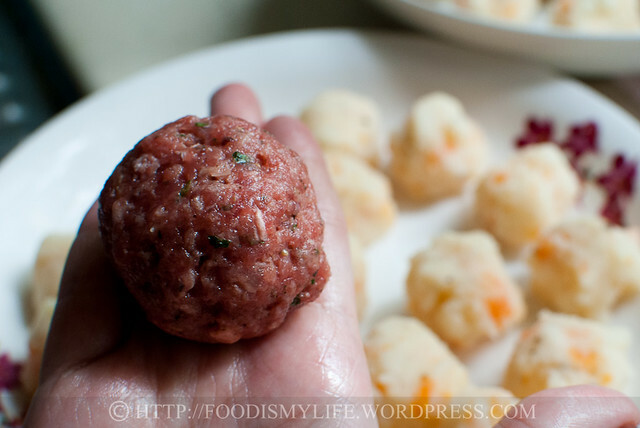 These, Jasline, look like some seriously good meatballs! I’m always on the look-out for a tasty meatball recipe. And I think that frying up the left-over portato mixture is a great idea. Your final picture looks delicious. 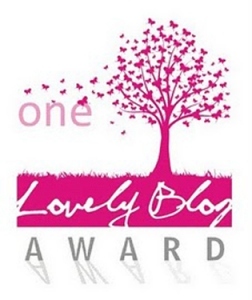 Thank you for nominating my blog for the One Lovely Blog Award. I’m honored to be both nominated and included in your group of nominees. Although I no longer accept awards & nominations, this doesn’t mean I do not appreciate them or am any less grateful. Thank you, Jasline, for your kindness. 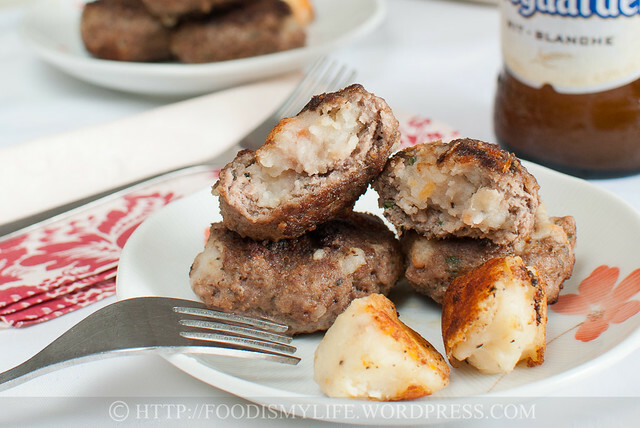 Your potato meatballs look absolutely delicious, yes, I bet they are pretty addictive! I would be the first one to reach out for these first! Hope you are having fun right now! This is quite an unique way of cooking meatballs. Very nice! Thanks, Jasline for the nomination! Hoping you’re having a great time travelling. 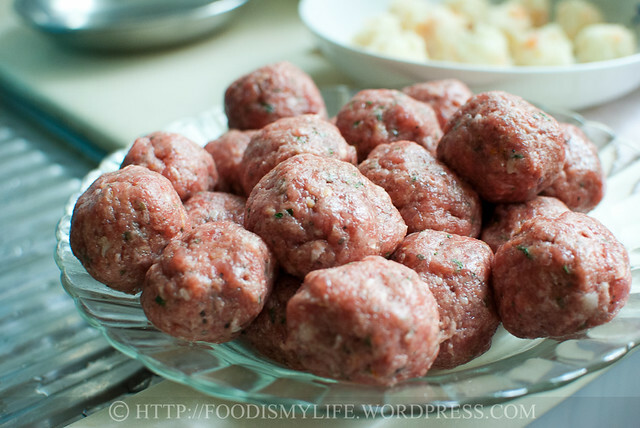 I’ve heard of something similar to these meatballs that might’ve been Russian or Central European. Still have’t made them. Yours read and look delicious. These look great! Definitely making after my cleanse. Wow, this is making me very hungry, Jasline. Have a great holiday! Thank you for your kind words! You more than deserve the award, judging also from this recipe!! Thanks for scheduling these gorgeous posts! These look delicious!! I know someone who would absolutely love these!